It is our local governments that we look to for many of the basic functions of government – including education, public safety, and public health. But in Connecticut, the cost of municipal government is driven up by state mandates, inflating our property tax bills and making it harder for people to live here. 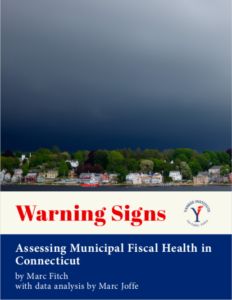 This study examines the fiscal health of Connecticut’s 169 municipalities. It does so by measuring several factors — including debt costs, pension and retiree healthcare liabilities, savings, and recent changes in property values and unemployment. The findings are a warning that problems could lie ahead for many of Connecticut’s cities and towns. Eight municipalities received a score that indicates they are in severe fiscal distress, while another 53 received scores considered marginal. Most of Connecticut’s largest cities fell below the red line. These cities have many things in common – including high poverty levels, relatively high unemployment, and greater union political power. But it isn’t just Connecticut’s large cities that are struggling – the municipality with the lowest score was Hamden, home to Quinnipiac University. This town is plagued by high pension liabilities and high debt. All municipal leaders in Connecticut need greater authority to limit the growth of local property taxes, which are among the highest in the nation. State lawmakers could provide meaningful relief by reforming the collective bargaining and binding arbitration laws that are hamstringing municipal budgets across our state. We hope this report is both useful and instructive as we move forward in trying to restore fiscal sanity to Connecticut.